One of my favorite aspects of planning field trips is finding unique places to visit in Southern California. Taking a field trip to your local airport is one of them! Spending time at your local airport is a fun and educational way to watch what happens at the airport. So do you love to attend air shows, are an avid fan of aviation or raising a future pilot-in-training? 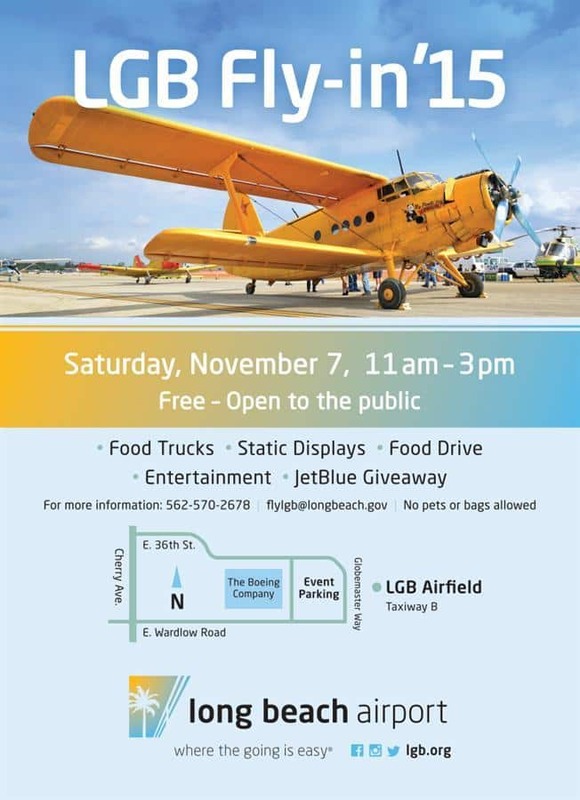 Then you will want to take your family this Saturday, November 7 to the annual LGB Fly-In at the Long Beach Airport. It is entirely FREE and open to the public! Put your piloting skills to the test in this lively air show that introduces you to the history, majesty, science, and technology of aviation! With a collection of both modern and historic aircraft on static display, people of all ages will enjoy learning about aviation first hand. There will also be food trucks, live entertainment and giveaways by JetBlue. Attendees are encouraged to bring non-perishable food items to donate to Food Finders. Why not take the airport shuttle, train, or other public transport and save yourself the hassle of driving and parking! This is as much a part of the learning experience as the visit itself. LGB Fly-In ’15 on November 7 from 11 am – 3 pm is a great outing for the entire family! I hope to see you there.